Is this Abu Dhabi’s most indulgent hotel? The glitz and glamour of a luxury hotel can sometimes be at odds with the informal atmosphere of an alluring sun-soaked beach; you often have to go for one or the other. Not so at the Shangri-La, Qaryat Al Beri, Abu Dhabi, which fuses the two perfectly. While it’s just 20 minutes from the airport, the hotel boasts manicured gardens paired with a kilometre of private beach. What makes this stretch of sand so special is this view of the magnificent Sheikh Zayed Grand Mosque sitting across the waterway. The 213 rooms and suites (from $460 a night), each come with a balcony or terrace and chic Arabic touches throughout. If you want real seclusion, the hotel also has six four-bedroom villas (from $1386 a night), each with its own pool and some with private cinema. Oh, and they come with a butler to serve your every whim. 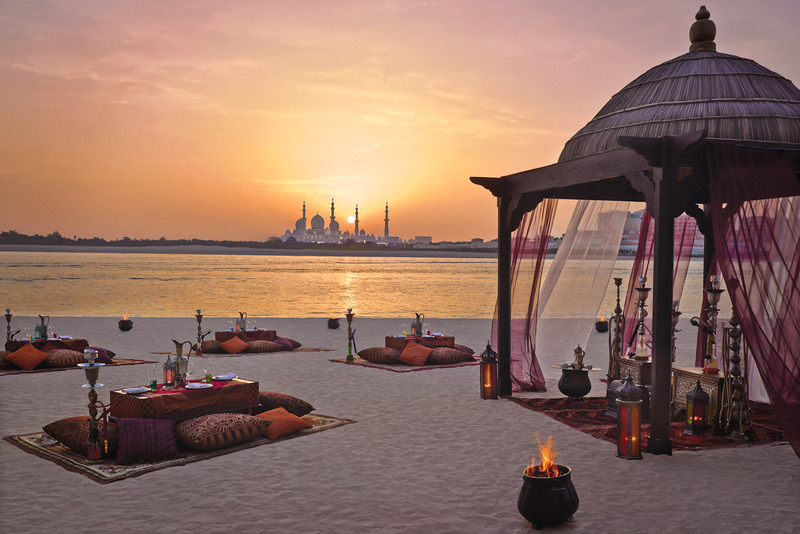 While there’s an array of restaurants to suit any craving, and two hip cocktail bars, if you really want to chill out, then sink in among the cushions and aromatic shishas on the beach, and watch the Sun set over the Persian Gulf.